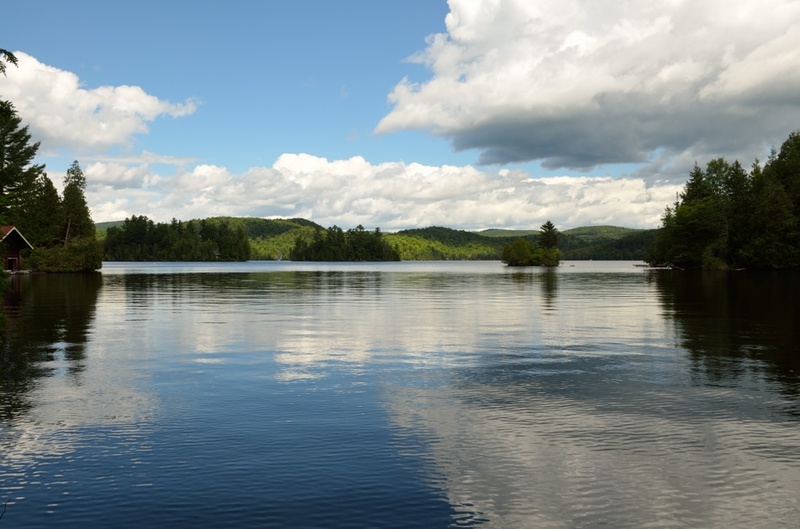 I just returned from two delightful days in a cabin by a lake in the Laurentian Mountains, Quebec. It was a girls’ getaway with three wonderful friends of mine. 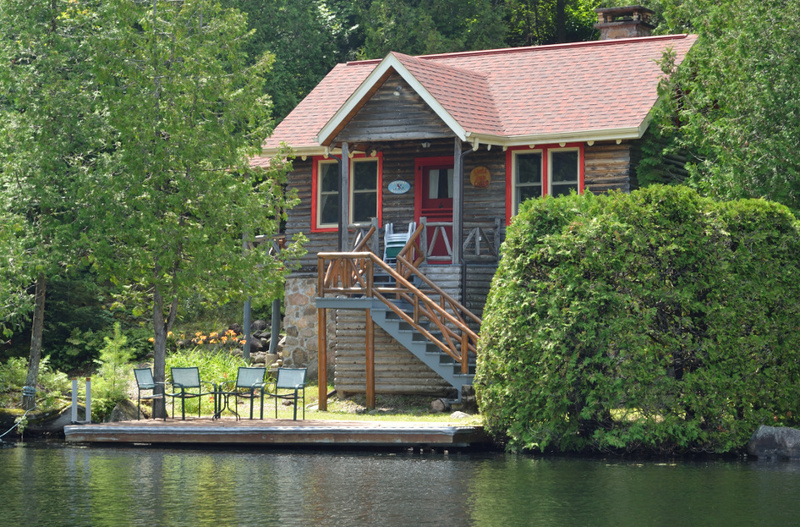 Three of us drove from Ottawa to meet the fourth who had rented what we thought was a rustic hunting cabin by a lake. Not so rustic after all. 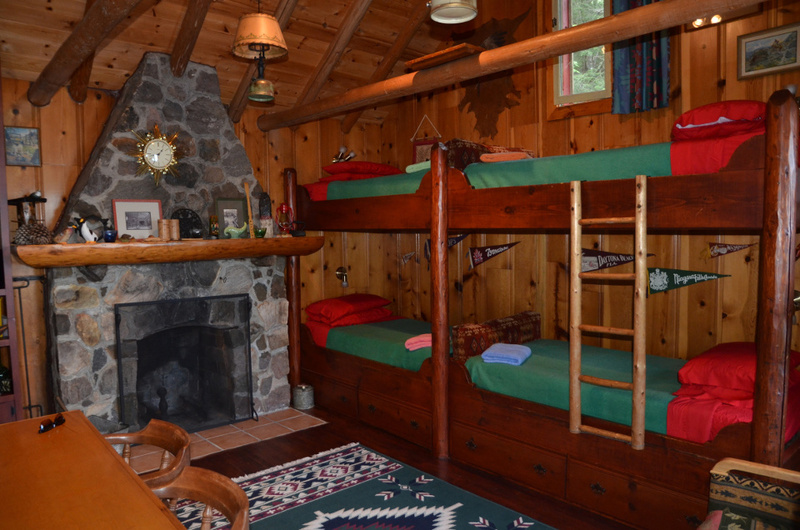 The cabin was perfect for the four of us and was filled with all sorts of cottage charm. The dock caught the sun most of the day and our view was beautiful. We swam, talked, ate and relaxed. A loon and a heron dropped by and I waited with camera in hand for it to take flight. It was far more patient than I. Late afternoon on our second day the clouds rolled in and it poured. We began to think we might be forced to stay an extra night. That would not have been hard to take. The storm turned out to be a teaser for what was to come later in the evening; soon the lake was calm again and we were overwhelmed by the double rainbow right in front of us. This entry was posted in Uncategorized on August 2, 2015 by Heather. We have now received four boxes from Mike’s Garden Harvest as part of our CSA membership. It is fun to see what is in each new box and I love having food delivered to my door! One of our boxes included some little carrots which were so tasty and fresh I didn’t want to cook them. Instead we grated them into a Carrot & Cumin salad which went nicely with a Thai Pork Green Curry. Chop coursely four spring onions and six swiss chard leaves. Saute spring onions and chard in skillet with vegetable oil until onions begin to turn gold and chard withers. Beat two eggs with a fork, add a tablespoon of milk or water. Pour eggs over onions and chard. While eggs cook sprinkle chopped fresh chives, oregano and thyme plus a sprinkle of salt and pepper over the top. 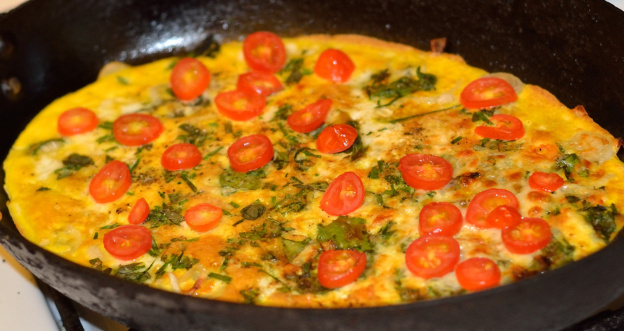 When base of omelette is lightly browned top with grated cheese and sliced grape tomatoes. Brown the top of the omelette under the broiler. When garlic turns pale gold, add tomatoes and turn heat to very low. Cook uncovered until oil floats free of tomatoes, about 20 minutes. Add salt and grindings of pepper and cook another 2-3 minnutes, stirring from time to time. Off the heat, stir in the torn basil leaves. This week’s box included more than enough green beans for our family of five so I chose Jamie Oliver’s Good Old French Bean Salad to have with sausages one night. This entry was posted in CSA Mystery Box and tagged food, Mike's Garden Harvest, Ottawa on July 19, 2015 by Heather. Our second box from Mike’s garden harvest was delivered on Canada day and included a treat in celebration of the day. We have been promised vegetables but in the box was a little punnet of strawberries and a bunch of rhubarb. Andrew turned them into two delicious desserts, a Strawberry and Rhubarb Crisp with an almond meal topping based on this Raspberry Rhubarb Crisp Recipe and a Sticky Rhubarb and Ginger cake. Both were delicious. 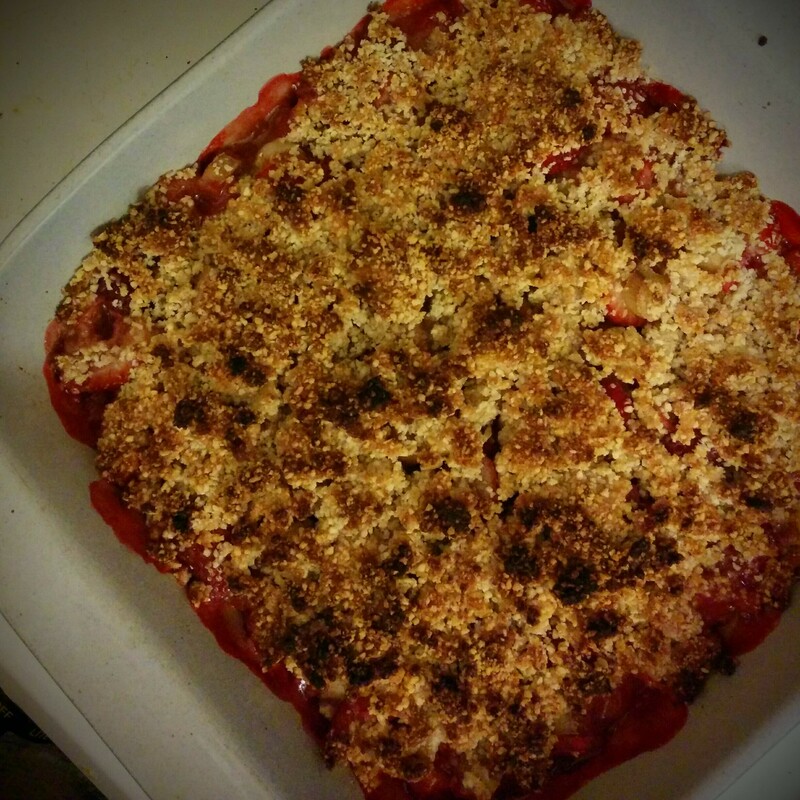 I also made a Strawberry and Rhubarb Crisp with the second bunch of rhubarb using a very similar recipe. The remainder of the box was made up of more salad greens, radishes, and onions so we kept making salads with fresh, tasty ingredients. Andrew used some of the lambs quarters from the first box in Lentil Burgers which we all enjoyed, even the serious meat lovers. This entry was posted in CSA Mystery Box and tagged food, Mike's Garden Harvest, Ottawa on July 18, 2015 by Heather. A few months ago we signed up with a Community Supported Agriculture venture and this week received our first box of produce, grown just down the road from us. Our vegetables come from Mike’s Garden Harvest and Mike, himself delivered our box on Wednesday night. Receiving a box of herbs and vegetables each week reminds me of the mystery box challenge from MasterChef. I also sautéed some of the radishes in a brown butter and lemon sauce. I don’t think I’ve ever cooked radishes before; usually I cut them in patterns to serve with salad. 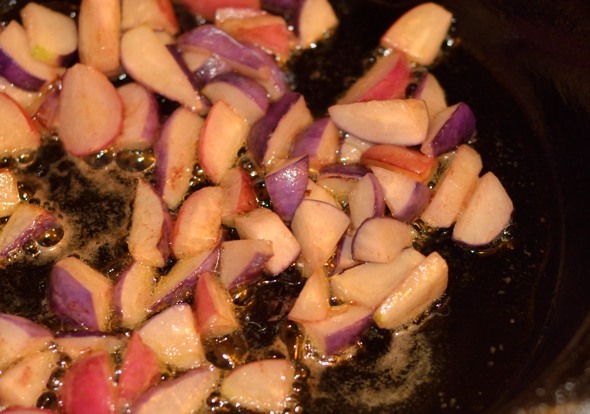 They looked pretty bubbling away in the pan as there were purple and pink ones. 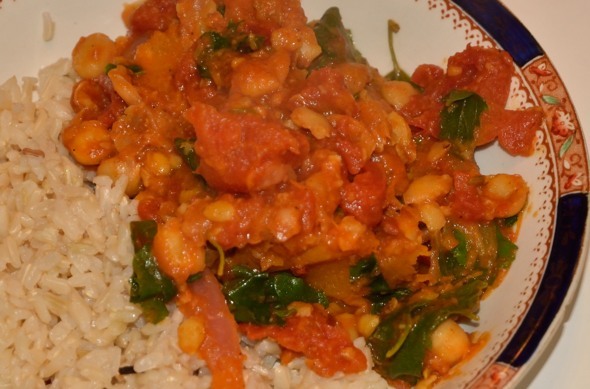 Andrew used some of the lamb’s quarters in place of spinach in a Butternut Squash, Chickpea and Spinach Curry. I did the same thing and replaced the spinach with lamb’s quarters when I made Sun-dried Tomato Spinach Rice Pilaf. By the end of the week we still had some vegetables left, all still looking green and fresh. I can’t promise that I will blog about our mystery box every week but I will do my best to write about the contents and our recipes as often as I can. 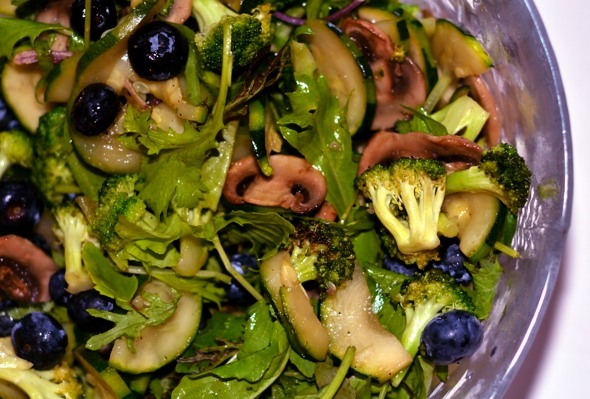 This entry was posted in CSA Mystery Box, Food and tagged Community Supported Agriculture, food, Mike's Garden Harvest on July 1, 2015 by Heather.